Freda, M.C., & Nicoll, L.H. (2011). 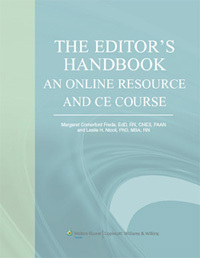 The Editor’s Handbook: An Online Resource and CE Course. Philadelphia, PA: Lippincott Williams & Wilkins. Blancett Smith SP. Nursing journalism leadership. Nurs Admin Quarterly. 1997;22(1):16-22. Baggs, J.G. (1998). Please join our scholarly group: Valuing the manuscript review process. Research in Nursing & Health, 21, 101-102. Baggs, J. G. (1999). The value of the blind review process: Is blindness best? (editorial). Research in Nursing & Health, 22, 93-94. Baggs, J. G., & Minicucci, D. (2000). Shining a light on the black box of the review process at Research in Nursing & Health (editorial). Research in Nursing & Health, 23, 1-2. Baggs, J. G., & Schmitt, M. H. (2001). Some ethics of manuscript reviewing (editorial). Research in Nursing & Health, 24, 81-82. Henly, S. J. and Dougherty, M. C. (2009). Quality of manuscript reviews in Nursing Research. Nursing Outlook, 57, 18-26. Hoyt, K.S. & Proehl, J.A. (2007). Peer review for professional publications. Advanced Emergency Nursing Journal, 29, 260-264. Shattell, M. M., Chinn, P. L., Thomas, S. P., & Cowling, W. R. (2009). Author’s and Editors’ Perspectives on Peer Review Quality in Three Scholarly Nursing Journals.Journal of Nursing Scholarship, 42(1), 58-65. Broome, M., Dougherty, M., Baggs, J. G., Kearney, M. H., & Freda, M. C. (2009). Ethical Concerns of Nursing Journal Reviewers: An International Survey. To be presented at JAMA/BMJ Conference on Peer Review and Biomedical Publication, 2009. Dougherty, M., Freda, M. C., Kearney, M. H., Baggs, J. G., & Broome M. (2009). Nursing journal peer reviewers use of impact factor and priorities in manuscript reviews. To be presented at JAMA/BMJ Conference on Peer Review and Biomedical Publication, 2009. Kearney, M. H., Baggs, J., Broome, M., Dougherty, M., & Freda, M. C. (2008). Experience, Time Investment, and Motivators of Nursing Journal Peer Reviewers. Journal of Nursing Scholarship 40(4): 395-400. Baggs, J., Broome, M., Dougherty, M., Freda, M. C., & Kearney, M. H. (2008). Blinding in Peer Review: The Preferences of Reviewers for Nursing Journals. Journal of Advanced Nursing 64(2): 131-138. Freda, M. C., Kearney, M. H., Baggs, J., Broome, M., & Dougherty M. (2008). Peer Reviewer Training and Editor Support: Results from an International Survey of Nursing Peer Reviewers. Journal of Professional Nursing 25(2): 101-108. Freda, M. C., & Kearney, M. H. (2007). A First Look at Nurse Editors’ Compensation. Nursing Economics 25(6), 371-375. Kearney, M. H., & Freda, M. C. (2006). “Voice of the Profession”: Nurse Editors as Leaders. Nursing Outlook 54(5): 263-267. Kearney, M. H. & Freda, M. C. (2005). Nurse Editors’ Views on the Peer Review Process. Research in Nursing and Health 27(6):1-9. Freda, M. C., & Kearney, M. H. (2005). Ethical Issues Faced By Nursing Editors. Western Journal of Nursing Research 27(4):487-99. Freda, M. C. & Kearney, M. H. (2005). An International Survey of Nurse Editors’ Roles and Practices. Journal of Nursing Scholarship 37 (1):87-94.